As a wedding photographer with a natural photography style, a simple approach, and a heart that beats for love, Mindy Bean creates wedding imagery that displays the moments that matter to a bride and groom. It’s the emotion of the day, the vows of the ceremony, and the atmosphere at a reception. But most of all through Mindy Bean Photography, it’s the intimacy shared between each bride and groom that makes its way to the forefront of their photos. “We’re all about the natural reactions between moments,” Mindy Bean of Mindy Bean Photography said at the recent Bridal Spectacular bridal show. But while Bean and her team aim to capture a couple’s natural interactions in their photography, they also take care to deliver the professional edge. Through this interaction, Bean may encourage a couple through conversation, jokes, movement, and even a selected background for a photograph. 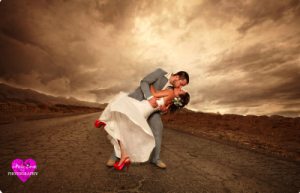 With this approach, a bride and groom’s photographs become all the more potent, telling, and breathtaking. However, before Bean photographs any couple, she takes time to learn more about their interests and their interactions through an in-person meeting with local brides or a Skype conversation with destination brides. This allows a couple to become comfortable with Bean, her husband Doug, and/or their professional photography associates. “We will take the time and get to know them,” Bean said. In addition to this pre-meeting, Bean also suggests brides and grooms partner with her for engagement photographs. Then with any worries removed, a bride and groom will feel comfortable to be themselves in front of the camera. As a result, all their photographs accurately reflect the feeling of those moments, the atmosphere of their special day, and the love that shines forth in their own unique ways. While many brides view their Las Vegas weddings as their photography highlights, Mindy Bean Photography also offers options for beyond the wedding day, from future family portraiture to “Trash the Dress” sessions. While a “Trash the Dress” session does mean a bride won’t have her bridal gown for posterity’s sake, she will receive photographs that exhibit her uninhibited style. Whether or not a bride chooses to “Trash the Dress,” Mindy Bean Photography provides plenty of modern and traditional opportunities for bridal portraits, wedding day photography, and more. Best of all, these options are available for affordable prices. With affordable prices, a variety of packages, and Bean’s excitement to work couples in love, each bride and groom can expect exactly what they hoped for—wedding photographs that display just who they are. To learn more about Veils, Tails, & Cocktails or additional Las Vegas wedding photographers, please visit the official website of Bridal Spectacular.